The condition of the vinyl isexcellent+. The sleeveis still in it's original shrinkwrap but has been opened at the right hand edge. The labels areclean witha couple ofvery mildlight spindle marks. 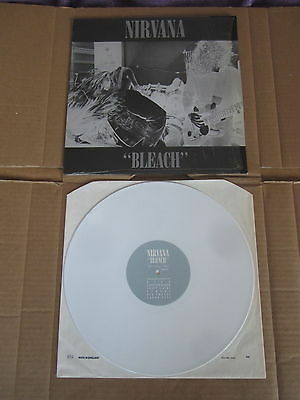 A stunningcopy of this Nirvana holy grail! UKRoyal MailRecorded Free or Special delivery £9.00. Europe AirmailInternational Signed For £12.50. Rest Of The World AirmailInternational Signed For £15.50. Each additional LP / 12” / 10” £1 per item. 2x LP/ 12” / 10” are charged as per additional items. These prices are based on items / parcels up to 2kg. All items are professionally packaged in brand new record mailers with two new card stiffeners & marked with a ‘fragile handle with care’ sticker. The records are also separated from the sleeve and placed in paper sleeve & poly covers. I strongly recommend on all items recorded delivery within the UK and International Signed For option for Europe / Rest Of The World as this provides tracking information in the unlikely event of a lost item. All Items /Packages sold for over £25.00 willbe required to besent Recorded /Internationally Signed For. I get proof of posting on all items from the Post Office. International buyers please note Import duties, taxes and charges are not included in the item price or P&P charges. These charges are the buyer’s responsibility; please check with your country’s customs office to determine what these additional costs will be prior to bidding/buying. I cannot not mark items value below sales value or mark as ‘gift’ so please don’t ask.